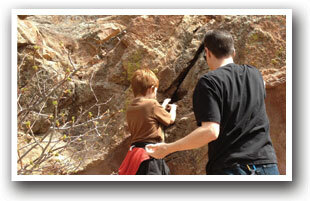 Boulder resides at the base of Colorado's famous flatirons rock formation. Founded in 1859 as the Boulder City Town Company, the stage was set early for notoriety across the globe. Recognized for its commitment to the outdoors, eco-friendly policies and safety, visitors never cease to be amazed by Boulder's commitment to outdoor recreation. 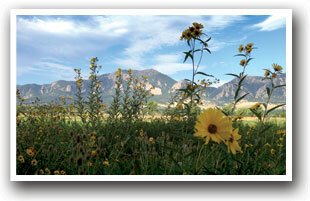 Located northwest of town, Chautauqua Park offers the perfect backdrop for hiking and biking around Boulder. 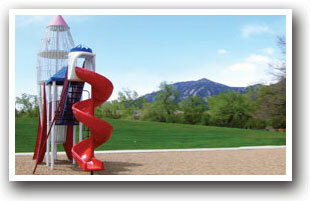 View the flatirons from below at the picnic shelter or the city from above along the Boulder Mountain Parks trails. Scott Carpenter Park, named after the famous astronaut who called Boulder his home, provides a more central location for family outings. Shopping on the Pearl Street and 29th Street malls embraces Boulder's outdoor theme. Popular apparel, novelty and dining establishments bring excitement rain, snow or shine. The Pearl Street Mall is home to street performers such as musicians, The Contortionist, The Balloon Man, and The Zip Code Man. 29th Street Mall features contemporary shopping and entertainment with a movie theatre and department stores. Coffee shops and microbreweries provide additional pleasure and some much-needed time to relax with your favorite beverage. Boulder Reservoir is a summer hot spot for swimming, sailing and waterskiing. Located along Highway 119 (the Diagonal Highway), the facility hosts triathlons and a marathon among other swimming and cycling events. Boulder Kayak Playpark is located at the mouth of Boulder Canyon on Boulder Creek and starts with a six-foot slide drop into a huge pool; such an exciting way to start the course. Much of the course consists of small drops and holes that land in large pools. There's also eddies, plat rocks, and squirt lines to keep any level of kayaker amused. Keep in mind, this park was built before modern day play boats so some of the drop structures may not work out best for your equipment. Memorial Day in Boulder means BolderBoulder 10K road race. Runners from all over the world participate for fun and prizes. Boulder Creek Festival kicks off summer for 23 years, it's free for everyone and features arts, games, music and dance. At the core of Boulder's culture are creative arts. The Shakespeare Festival, Boulder International Film Festival and music performed in historic Macky Auditorium offer a glimpse into the town's taste for entertainment. 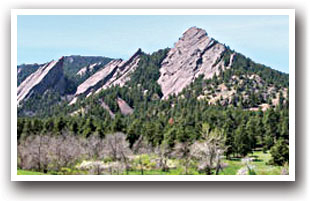 Boulder also has been featured on TV, movies, in books and music. The house at 1619 Pine Street was used as the house on Mork and Mindy in addition to Perfect Stranger's, Stephen King made Boulder the setting in his book The Stand, the Pearl Street Mall played a part in Catch and Release, Johnny Cash references Boulder in his song Highway Man.